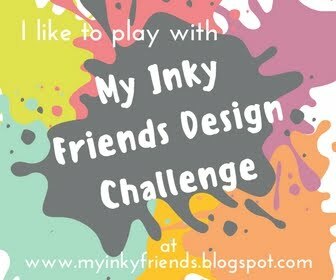 I am interrupting my display samples to join my Inky Friends in another blog hop. This time we are putting the retiring 2016-18 in colors in the spotlight: Dapper Denim, Peek-a-boo Peach, Flirty Flamingo (Will becoming part of the core color line! ), Emerald Envy, and Sweet Sugarplum. We have some fun projects showing off these colors, so make sure you follow the blog hop for all the inspiration! You may have come here from the talented Tanya or from the Sensational Shelley if you are traveling backwards through the hop. I am putting Peek-a-boo Peach in the spotlight. I love how fresh and fun this color is. This card uses Swirly Bird and All Things Thanks stamp sets. I used the small swirl to create a fun background. The banner die cut is a fun way to highlight part of the sentiment. I love Peek-a-boo Peach with the Wood Textures Designer Series Paper. The dainty flowers of the Floral Sentiments set help showcase this great color. I hope you are inspired to give Peek-a-Boo Peach a little love. Make sure you continue through to all the blogs in our hop for more great color projects! Thanks for stopping! Happy Stamping! Today, I am playing along with my friend Mindy and the Fab Friday crew. They have a great color challenge going on. I love the jewel tones of this combo. And here the card I made using the Beautiful Peacock set. This is one of the great Sale-A-Bration offerings this year. It can be yours FREE with a $50 purchase! On the Emerald Envy wing – I peeled off a layer of the card stock so it has a soft texture you can’t see in the photo. I drew on the eye lashes to give a more demure look. The Petal Burst embossing folder compliments the feather / leaves in the tail. Sweet card to give a dear friend. Thanks for visiting! Happy Stamping!